The Tapestry of Bayeux depicts the knights and guardsman of William the Conqueror. On their heads rest Spangenhelms similar to the Blacwin Darkened Norman Helmet, a perfect fit for those who wish to reenact the Battle of Hastings. 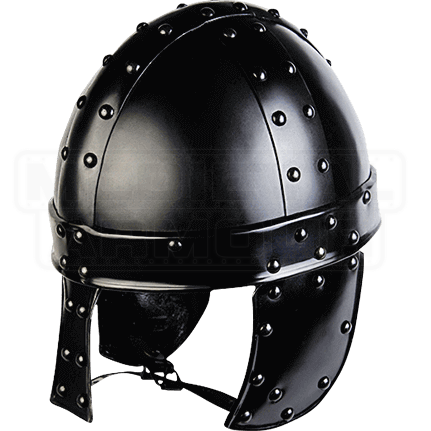 Handcrafted from 18-gauge steel, this nasal helmet consists of a ridged dome with nose guard and cheek flaps. Ridges and rivets provide extra protection against blows. An inner lining increases the comfort and fit of the helmet, while adjustable buckle straps secure it at the chin. The darkened finish is due to an electrochemical treatment, which aids in rust resistance. This is so much heavier and nicer than pictures can show. So nice and solid. The inner padding is perfect. Only downside is the chin strap is positioned way too far forward and is basically un-useable sitting out in front of your chin. Helmet is soooo nice though. Great customer service, always.